Pentecost is the "feast day" of Holy Spirit Province. 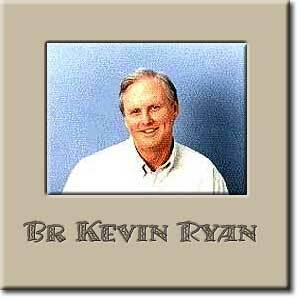 This is the full text of Province Leader, Br Kevin Ryan's, Pentecost reflection for the Brothers which has wider application for all of us working in the wider Edmund Rice Network. VER THE LAST THIRTY-SEVEN YEARS most of you who will read this reflection have been members of the Holy Spirit Province of the Christian Brothers. Perhaps it is timely to reflect on this a little as we move towards the celebration of Pentecost, the celebration of the Spirit. Eventually this reflection will lead us to the "upper room" and "the Pentecost experience", but let us wander firstly through our own individual lives and our life as a Province in Australia. A reflection on the Holy Spirit in our lives leads us fairly naturally to reflect on our own spirituality or 'life in the Spirit'. So what is the context in which we as individual Brothers and as a Province have been or are doing that. This reflection can also perhaps make a small contribution to addressing a question that emerged at the recent province day in Perth. That question related to the spirituality of the Brothers. 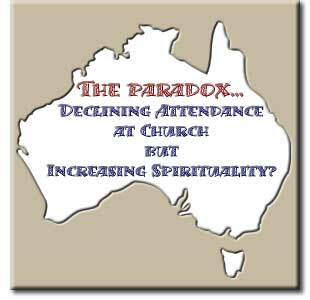 There is a smaller percentage of Australians (including Catholics) who attend a weekly Eucharist or any Church service, but an apparently growing number who say they have a "spirituality". Both of these issues are most sharply apparent in the 18 - 35 years age group. A growing number of Australians have taken interest in matters of environment and ecology, Indigenous spirituality, 'Eastern religions', 'the Anzac spirit', 'celtic spirituality' and similar matters. For many these have led them to a growing understanding of their own spirituality. Today as well as some Australians continuing to be very money oriented and materialistic, there is a growing trend in some businesses and professions for women and men in their 30's and 40's to make career choices which provide more balance in their work, family and personal life, and in doing so to sacrifice financial income. Is this a choice for spirituality? Having said that, there continues to be in Australia, a continuing (and arguably growing) sense of alienation from society and life by many young people who are living in situations of poverty, violence and meaningless. Even some more financially well off people have this sense of meaningless about their lives. 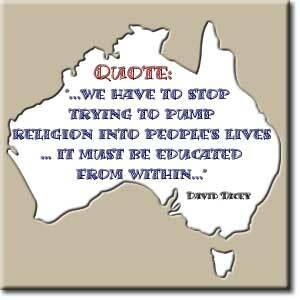 You will have your own experience of Australia to add to, complement or conflict with what I have written. Searched for more information about the life and 'spirit' of Edmund. Confirmed in our Constitutions which define our way of life, that the Eucharist is central to our lives, but also highlighted the need to share our faith in our community prayer (cf Cons 44, 46 and Cons 31). This was a critical change in our Congregation Spirituality and is reflected in the 1996 and 2002 Chapter documents. Created a Congregation chapter document called "The Heart of Being Brother" which reflects our recent search for a deeper understanding of who we are as Brothers and our wish to deepen our spirituality, our 'life of the Spirit'. In my opinion the 1984 constitutions, and the 1996 and 2002 chapter documents, gave a significantly new shape to how our Congregation spirituality is expressed. Finally, and most confronting for us all it has become very clear since the Second Vatican Council that with the role of the laity in the Church clearly affirmed, and with the call of everyone to "holiness", if we define ourselves by what we do rather then who we are, we are doomed to despair. This does not of course lessen the urgent call for us to express ourselves in ministry but this must be an expression of who we are. Once again I encourage you to reflect on this in order to surface your own individual experience and your experience of the Province. '. He also highlights that spirituality is closely related to our involvement in the environment, justice, community and relationships and is often deepened through pain and loss. And Fr David Ransom (a priest in the Broken Bay diocese of Sydney) bases his exploration of this issue on a Hebraic understanding that 'spirituality' is concerned with force and energy, a vitality in life, a 'coming awake', an increased awareness about life and a deepened sensitivity to its rhythms. It relates us to life more deeply! There is no doubt that the lives of all in our province are true to our province name. 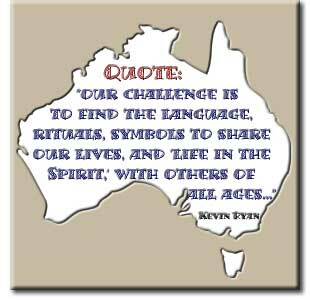 We are 'men of the Spirit'. Our recent discussions on the future of our communities highlight that. We can feel contented and at peace with that. For many of our Brothers, it seems that it is important that their personal lives, community lives and their ministries link closely with their prayer lives. This is effectively reflecting on all aspects of their lives in the light of the scriptures and in the light of Edmund Rice's life and spirit. This seems to be how they express their spiritualties. This is the way they integrate their relationship with their God (the Eucharist, their Creator) with their own experience of life, relationships, the environment and their ministries. This seems to be how they express the spirituality expressed in our constitutions and chapter documents. Or maybe what has happened is that our documents have expressed what our spirituality has become. Perhaps we need to check these documents to see whether they express who we are and/or whether we express in our lives who they are challenging us to become. And there is a new challenge! Yes, our challenge is to find the language, rituals, symbols to share our lives, and 'life in the Spirit' with others of all ages who are not Catholic or Christian in the same way as we are, and who come to their spirituality through justice, ecology, through relationships or simply an 'inner search'. Research suggests that unless these people can express their spirituality in community, connect to a deeper story (e.g. the Edmund story or the Jesus story), or ritualise or symbolise their experience, their spirituality is likely to die. We must stay connected to our core story, without its historic accretions, and be prepared to explore the edges with these people ... for their life and growth, for the future of the Gospel ... and for our own future life. Our spirituality depends on our sharing it with others. This reflection is of course brief and unable to explore all the subtleties that are involved in what is proposed above. These challenges and subtleties are, I hope, to be explored in prayer gatherings, over meals and in personal contemplation ... and in Spirit filled gatherings like the 'Upper Room' experience. Let me conclude with a prayer and a reflection shared with the Leadership Team and others by Br Kevin Mullan and Br Francis Hall on behalf of the Province Leadership Team. You are the centre, you are my life. You are the centre, O Lord of my life. Come, Lord, and guide me, Lord of my life. Send me your Spirit, Lord of my life. You are the centre, Lord of my life. Come, Lord, and heal me, Lord of my life. Come, Lord, and teach me, Lord of my life. Your are the centre, Lord of my life. Give me your Spirit and teach me your ways. Give me your peace, Lord, and set me free. is to already have lost hope. From the past to the present and extending it into the future. For God's spirit will make all things new." A. Gittins "Reading the Clouds"
May the feast of the Holy Spirit in-SPIRE you!